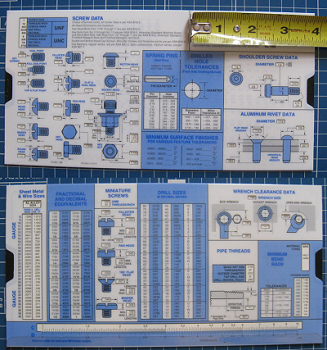 ANSI Screw Engineering Slide Chart Selector hardware quick reference sliding reference chart. Includes ANSI data for: screws, rivet, bolt, nut, pipe thread, spring pins, drilled hole tolerances, shoulder screw data, aluminum rivet, minimum surface finishes, wrench clearance data, drill sizes, miniature screws, sheet metal & wire gauge sizes. All units in inches. Made from durable formed plastic. Size 5 X 10 inches. This Tad style slide chart is an absolute must have for mechanical designers, drafters and engineers to ensure that the highest productivity is achieved. Advanced AutoCAD ® 2018 Exercise Workbook Sale! Beginning AutoCAD ® 2018 Exercise Workbook Sale! AutoCAD Pocket Reference, Seventh Edition Sale! Una herramienta ( ANSI Srew Engineering Slide Chart Selector ..